Grace Dieu Priory ruins, near Belton, Leicestershire. OS grid reference: SK 4353 1835. 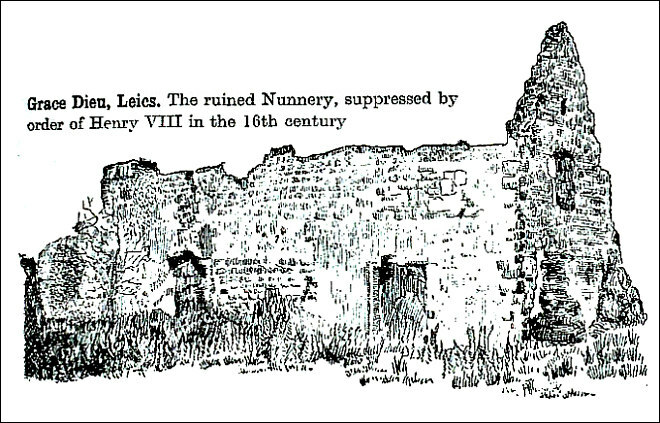 The sad, crumbling ruins of Grace Dieu priory, a 13th century religious house, lie just to the east of the A512 Ashby Road and Grace Dieu brook – about halfway between the villages of Belton and Thringstone, Leicestershire. Since about the middle of the 16th century the priory buildings have been left to fall into decay and crumble away, with only the walls and gable-ends standing tall at what was, back in the Middle Ages, a large priory of Augustine (Augustinian) canonesses, with an attached hospice for the poor and infirm. The ruins are 500m north-west of Abbey Ford farm and just south of where Ashby Road meets with Gracedieu Lane, south of Belton. The priory of Grace Dieu (Grace of God) was founded in 1239 by Roesia (Rose) de Verdon, who was a noblewoman and landowner from Belton, and dedicated to St Mary, God and the Holy Trinity. Agnes de Gresley was the first prioress. It was in essence an “independent” religious house of Augustinian canonesses (also known as the White Nuns of St Augustine), and apparently a ‘strict’ order of sisters. This was probably the only house of the order in England. The walls and gable-ends of the nave (church), chapter-house and south range are still standing, although now roofless and skeletal and with much stonework missing, windows now gaping holes, and walls only half their original height; the nave (E side) is perhaps the best preserved part and is entered through a stone archway. After the Dissolution and subsequent “late” closure of the house in 1538-9 much of the stonework was used in order to build the attached private residence. There are only scant foundations of the kitchens, infirmary (guest house) and late 14th century hospice for the poor and infirm, which only ever housed 12 local people at any one time. The nearby earthworks are probably the priory’s fishponds. After 1539 the priory ruins were sold and then a private mansion house was built beside the ruins, much of the stonework coming from the priory walls. In the mid-17th century it was sold again to a wealthy lawyer of Garendon Abbey. It was he who added to the priory’s destruction. By 1730 the religious buildings were in a very ruinous state, with only two large sections remaining, but with their roofs still intact. In the 1830s the ruins were again sold off. Today the ruins are said to be the haunt of a ghostly figure who has been referred to as ‘the white lady’. This is perhaps the ghost of Agnes de Litherland, the last prioress? The tomb of the foundress Roesia de Verdon was originally in the priory church, but this was taken for safety to St John’s Church at Belton. She apparently inaugurated an annual fair in the village, which is still held in late May or early June, mainly for the sale of horses (Folklore Myths and Legends of Britain). Bottomley, Frank, The Abbey Explorer’s Guide, Kaye & Ward Ltd., Kingswood, Tadworth, Surrey, 1981. Reader’s Digest, Folklore Myths and Legends of Britain, Reader’s Digest Association Limited, London, 1977. Wright, Geoffrey N., Discovering Abbeys and Priories, (Third Edition), Shire Publications Ltd., Princess Risborough, Bucks, 1994. Categories: Abbey or Priory | Tags: Grace Dieu Priory Near Belton in Leicestershire | Permalink.